Immigration is the thorn in everyone’s side. Both parties say they want immigration reform. And both parties have dithered on it. Right now, both sides are trying to offer protections to the so-called DREAMERS, illegals who were brought over as children. There are some 800,000 of them. Yes, we know where they are and where they live; that was part of the application process for DACA, the Deferred Action fro Childhood Arrivals program, which was enacted under the Obama White House. It’s arguably unconstitutional. It’s legislation; the executive does not do that. There are serious questions about separation of powers. Regardless, the phased draw down of DACA by the Trump White House spurred legal challenges. Trump’s plan was a gradual phasing out, with a six-month enforcement delay to allow Congress to fix DACA properly. No dice; the Democrats shut down the government over illegal aliens. It was nonsense. Trump offered another million on top of the 800,000 in his proposal to Democrats: a pathway to citizenship for DREAMERS in exchange for funding for a border wall. Not a bad idea, but it was nixed by Democrats. Now, we had moderate Republicans quarterbacking a discharge petition, which allows bills to be brought up without going through GOP leadership. It’s forcing the House GOP to tackle immigration, something that has to be put on the backburner as we head closer towards Election Day. It needs 218 votes to be a successful push and the moderate wing seemed to be on their way. 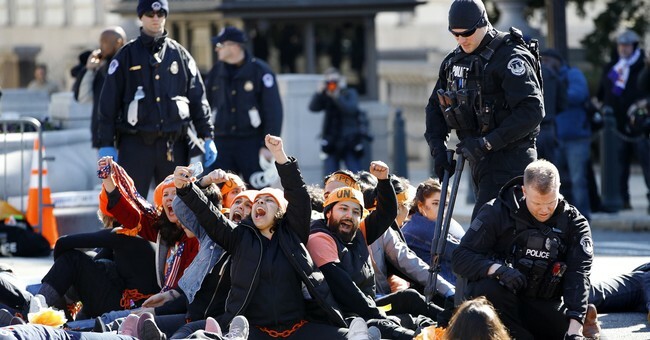 House Republicans will vote next week on two bills addressing the plight of hundreds of thousands of Dreamers who face possible deportation, circumventing an intra-party war over immigration and delivering a major blow to moderate Republicans. So they've been left to accept Speaker Paul Ryan's idea: One vote on a conservative proposal drafted by Judiciary Committee Chairman Bob Goodlatte (R-Va.), and a second on a compromise package still being assembled by Ryan in consultation with moderates and conservative Republicans. Neither is expected to pass, according to Republicans in all camps. The two-vote solution is a victory for GOP leaders, who were able to dissuade Republicans from signing the petition and triggering the bipartisan votes. Many believed the discharge petition would be a huge embarrassment to the GOP since it would likely result in passage of a bill giving citizenship to Dreamers without any major immigration crackdown demanded by most Republicans. It's unclear if the two-vote approach will give political cover to moderates, who are extremely worried about blowback in their districts over the lack of a DACA solution. Many of the 23 GOP discharge petition signers hail from districts with large Hispanic populations who want to see a bill passed, not merely a show vote. I still don’t get the point about playing Russian roulette with the base, but that’s the GOP I guess. If you want one issue to make Republicans stay home, it's immigration. You can't botch this and given that these bills aren’t expected to pass, what are we doing here. It’s only going to divide the party, while wasting time on other legislation that could pass, like more stringent work requirements for food stamps or cutting regulations. The time to do something on immigration this session has passed. I’m not happy about it. I want funding for the border wall. But when Democrats turned down the deal of the century on this issue, one in which even The Washington Post said DACA protections for a wall was not a bad sell, nothing was going to move. What the moderates have proposed is not acceptable to the conservative wing of the party. Will the moderate wing’s attempt to do something be rewarded come November? We’ll see, but they should have had more confidence in our economic growth to give them a legitimate and tangible selling point to voters and not whip out the cookie cutter that will split the caucus.